Pedalling through far-flung lands, immersed in the landscape, listening to the birds, absorbing the local culture from chats with new-found friends. Being in the moment: it’s you, your bike, the road and a never-ending string of fascinating encounters and experiences. These are just some of the many joys of Adventure Cycle-Touring. While backpackers spend their hours cooped up in old buses, racing from one ‘sight’ to the next, with a bike the whole world is your oyster. Take advantage of the great freedom to explore those places in between that public transport doesn’t reach, to head out on quiet roads through villages where you’ll feel like you’ve gone back in time, and to enjoy the beauty and simplicity of a biking-camping lifestyle. Fifteen kilometres an hour is the perfect speed for making satisfying progress across countries and continents, and you’ll always have time to pause for chai when beckoned over by a welcoming villager’s smile. And the crowning glory is that almost anyone can embark on a cycle tour; the forty-plus contributors to this book are not elite athletes. The only prerequisites are a thirst for adventure, the ability to ride a bike, and the strength of mind to convert your desire for a big trip into actually setting off. As many tourers will tell you, that first act of setting off is the hardest part. This isn’t to say your tour is all going to be easy or fun; it wouldn’t be an adventure if it was. There’ll be plenty of challenging days, particularly to begin with as you find your rhythm, and later when you can no longer resist the urge to head out onto rougher, more remote roads. But stick with it after making those first few pedal strokes and you’ll find a world of exciting riding awaits. This book is primarily concerned with the practicalities of going on lengthy and adventurous cycling trips, of exploring by bike countries your friends back home might not even have heard of, and certainly can’t pinpoint on a map. Preparation is key to your tour running smoothly and the Adventure Cycle-Touring Handbook aims to give you the necessary knowledge, inspiration and confidence to set forth and discover the world on two wheels your own way. Read on to find out what today’s bike tourers are choosing to ride and what gear they are using, which countries are being explored and what kind of riding to expect in each. Initially, taking the decision to head off on a big trip can seem daunting with a lot to take in and learn. But rest assured that it’s nothing too difficult, and by preparing and planning the most important aspects of your trip, you’ll soon work out the details that suit you best on the road. By the time you return home you’ll be surprised at the myriad of transferable life skills you’ve developed. Part One: Practicalities will help you understand the major issues which are thrown up as a consequence of deciding to embark on a tour and we’ll navigate you through the bureaucratic and practical factors to consider when planning a ride in the world’s adventurous zones. You may want to jump ahead to the Route Outlines (Parts Four, Five and Six) after this to get more ideas and detailed information about riding in exotic countries all over the globe; it’s well worth reading about the terrain and environments you can expect to find on any route you’re considering taking before you begin thinking about sorting out a bike and kit. 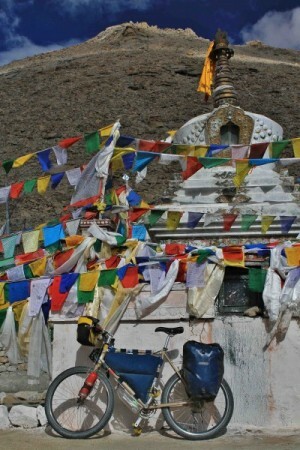 Part Two will help you prepare the bicycle and equipment that are best suited to your ride, and we’ll lead you through the most important decisions that need to be taken without complicated or confusing jargon, drawing on advice from a whole gamut of experienced tourers with hundreds of thousands of kilometres under their tyres. There’s some handy On the Road advice in Part Three, and after the Route Outlines we wrap up with the Tales from the Saddle – some rip-snorting but not atypical accounts of encounters that have taken place out there on two wheels. Dip into those as and when; but for now, a plan.